Black widow: found throughout North America, but are most common in the southern and western areas. Brown recluse: most commonly found in the Midwestern and southern states. Body: large of about 1/2-inch long. Legs: extend 1/2 to almost two inches. Coloring: brown with yellow chevron-shaped markings on the abdomen. Distinguishing marks: can be differentiated from other spiders because its short-haired legs do not have dark-colored bands. Prevalent throughout the Pacific Northwest. Outdoors in retaining walls, foundations, window wells, and stacks of firewood and bricks. Indoors in boxes, piles or other storage, under baseboard heaters or radiators, behind furniture, in closets. Generally near the ground whether indoors or out. It builds funnel webs in holes, cracks, and recesses. A funnel web, as the name implies, resembles a funnel, with one end wider than the other flattened end. It is built horizontally on the ground or into piles, or attached to stationary structures near the ground. Although they do not climb, hobo spiders do run very fast. Although not generally aggressive to people, they can attack or bite if they feel threatened. A person who has been bitten may not realize it, as it may not immediately cause any symptoms or reaction. However, a bite can be serious and result in a very slow-healing wound and permanent scar. In addition to general spider control methods, in areas where hobo spiders are prevalent, it is critical to keep wood, debris, and vegetation away from the house, as dead wood is a natural web and breeding site for hobo spiders. To keep them from entering the home, ensure that all windows and doors are well sealed and caulk cracks and gaps where the spiders could enter. The National Park Service (NPS) also recommends the use of glue traps as potentially effective and available from many sources. Additionally, when found, the spiders and their nests can be vacuumed, with the contents of the vacuum bag then placed in a sealed plastic bag and disposed of. It is also advised that gloves and protective clothing be worn in potentially infested areas. As stated by NPS, "Insecticides are not usually needed to manage web-building spiders, but if one seems to be indicated, confer with your region IPM coordinator to discuss this option." 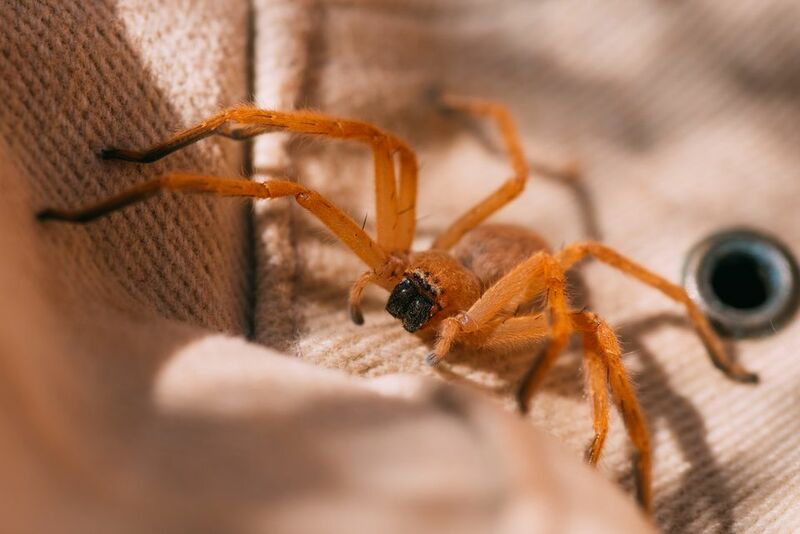 A 10-year-old boy in Oregon was bitten on the lower leg while asleep in bed in a home that was reported to be severely infested with hobo spiders. Within 48 hours of being bitten, two swollen, inflamed lesions about 1 1/4-inch in diameter developed on the boy's leg, and were hot to the touch, with central blistering. Seven days after the bite, the skin around the bite began to die and slough off, and the boy's leg and ankle became were red and swollen. The boy was feverish and nauseated, with severe headaches. Treatment included oral medication and alternating applications of heat and ice. After 30 days, the area still appeared bruised but tenderness had lessened, and the boy continued to experience migraine-like headaches for four months after the bite. A 42-year-old woman in Idaho felt a burning sensation on her ankle while working at a convenience store. When she rolled up the leg of her pants, she found a crushed brown spider, later identified as a hobo spider. The pain on her ankle persisted, and within 3 hours she was dizzy and nauseated and had a severe headache. An inflamed lesion with a blistered center was noted several hours later; by the next day, the blister had broken, leaving an open ulcer of about 3/4-inch. During the next 10 weeks, the ulcer deepened and expanded to almost 2 inches in diameter outlined in black. When the woman sought medical care, she was given antibiotics. The woman sought medical care 2 1/2 months after being bitten. She received a course of antibiotics, but the ulceration continued to enlarge, and swelling of the leg and toes impaired walking. Although it eventually healed, the bite left a cratered scar, and the woman remained unable to work in situations requiring standing or walking. A 56-year-old woman in Washington was bitten on her right thigh. Originally suspecting it to be an insect, she developed a severe headache, nausea, and altered mental activity within 24 hours. Although symptoms persisted, she did not seek medical attention for 1 1/2 months when she began to bleed from her ears and other points. She was admitted to a hospital, and despite transfusion therapy, she developed severe internal hemorrhage and died. An inspection of the woman's neighborhood found that hobo spiders were abundant along railroad tracks next to her home.